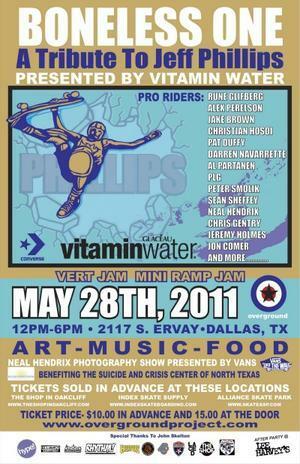 Boneless One is a charity tribute Vert and Mini Ramp Jam in Honor of Jeff Phillips benefiting the Suicide and Crisis Center of North Texas. Dallas, Texas has a ton of noteworthy historical figures, but the king of those badasses may very well be the late great skateboarding legend Jeff Phillips. When he skated, Jeff's power was undeniable – he consistently aggressed many a vert ramp and swimming pool, establishing himself as the counter to the sunny competition that pros Tony Hawk and Christian Hosoi provided to the masses of skateboarding fans of the day. There will be art, music, and food along with Rune Glifberg, Alex Perelson, Jake Brown, Darren Navarette, PLG, Pat Duffy, Cristian Hosoi, Sean Sheffey, Neal Hendrix, Peter Smolik, Chris Gentry,Jeremy Holmes, Jon Comer, and more at Overground Project skatepark this Saturday, May 28th in Dallas, TX.